I had no idea Empire was doing this kind of manufacturing here in the United States. The tour took us through two large areas, several stages of the manufacturing process, and covered several very well-known tools. On our first stop, we found ourselves in Empire Level’s impressive Quality Lab. Steve Lallensack, director of quality operations, showed us around. Quality Control lab might be a better description. He told us that they check (around three times) anything running in process through a shift. The room sat right in the Empire Level manufacturing facility and contained both expected test equipment as well as some high-end tools I had never seen up close before. A calibrating granite table took center stage while gauge blocks, a Micro-Vu vision system, and CMM machines filled the rest of the space. The Micro-Vu machine interested me in particular. It lets Empire look closely at finished products to determine accuracy on a scale not possible with traditional gauges. The Micro-Vu not only gives the operator a microscope view of edges, it also converts those measured coordinates to data for even more comparative analysis. It’s an incredibly objective way to ensure manufacturing is proceeding according to detailed specifications. Of course, we couldn’t help but notice that Empire lined the walls with competitive products they used in various ways—presumably to check against their own standards. We do the same thing with tool testing—you need to have perspective. The entire Empire Level manufacturing and distribution facility utilizes 210 hourly people working across three shifts plus another 65 engineers and operations staff. This robust manufacturing facility does far more than just produce a few products here and there. It runs all the time—and Empire has a schedule to add more and more manufacturing tools to its arsenal every year. We started this section at the robo drills, an automated CNC machine that allows 5-days a week, 2 shifts for creating things like the bodies for combination squares. It starts with a zinc casting, which Empire power washes and then powder coats. Next, the robo machine etches it to within 3/10 of a thousandth of an inch. That’s 0.0003 for those of you who like to see things in decimals. Empire replaced some machines with newer machines and they plan to expand further by automating the packaging. Automation doesn’t mean replacing people, however. For every new machine that gives them additional manufacturing capabilities, operators, engineers, and maintenance workers fill the gap. Next, we saw the aluminum extrusion process. At any time, Empire Level has two weeks worth of inventory from U.S.A.-based aluminum manufacturers. After receiving the material from trucks, they take the aluminum and use a 450-ton hydraulic press to take a die and form their rafter squares. The rafter square starts as a blank and then hits the “coining” process that does the metal forming to imprint the graduations and the shape of the rafter square. It’s called coining because it’s essentially the same kind of hard pressing action used to make quarters, dimes, nickels, and other coins. On Empire Level laser etched squares, they omit the coining process and a super powerful (and quick!) laser etches the markings across the blue anodized face. The laser actually burns off the anodizing oxide coating—permanently revealing the metal beneath. This makes for a permanent etch that doesn’t wear off or dim over time. The process uses a green laser which moves remarkably quickly over the surface. 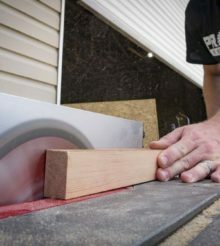 After stamping the rafter squares, a four spindle Komo CNC machine separates the parts and creates the tight right angle and the 45-degree angles for both pieces. The next machine we visited was a 1000-ton press. This progressive tool takes large wide coil steel stock and straightens it before entering the press. The similar coining process works to create steel framing squares. Interestingly, this machine found itself “sunk” into a 10-foot pit to help lessen the felt vibration as it worked. It did the trick, as the vibration felt about the same as the 450-ton press mounted to the shop floor. We focused next on the torpedo level manufacturing process. Using a CX2-1100 press, Empire stamps the aluminum and then blanks out the case holes while dadoing off the one side. The metal building connects to the plastics building via a short “tunnel”. The first machine we witnessed on this side of the facility was an automated system staffed with maintenance workers and operators. It loads up the I-beam pieces and applies the rubber and plastic pieces. A heat transfer process adds any required labeling. An ultrasonic welding process vibrates the parts at 60Hz to direct heat. It efficiently makes a complete weld for putting in the vial assemblies and handles so that they are perfectly aligned. Empire has amazing tolerances on these machines. Empire has all but perfected a “two-shot” molding process. This means they add the two different mold colors simultaneously in a single process. The vials and enclosures fasten to the frame in a way that ensures perfect alignment to the levels…every time. Two shot molding replaces and older process that molded and then assembled two separate color pieces. This now gets done in a single process, eliminating several tolerance issues. The Empire Level manufacturing plant has fully automated vial molding. The cylindrical vials start with precision molding the cylinders from high impact acrylic. Next, they fill, weld, and test them. Lastly, precision markings get added. The process resembles that of their block vials except that it uses a two-stage molding and marking process with a robodrill that machines the block, fills it, caps it, and finally welds it. Ever wonder how you make caution tape? This amazing process actually heats the raw material plastic and extrudes it to almost a liquid which then forms a bubble or bag. The material then whizzes through rollers where a corona treatment allows printing to occur (before that, you can’t even write on it with a Milwaukee InkZall marker). Empire can manufacture these in various colors and with any manner of printing, or they can store the rolls for later use. We’re really enjoying taking a closer look at U.S. manufacturing facilities. Similar tours at Milwaukee Hole Saw manufacturing, the Klein Heat Treatment plant, and Southwire Tools and Equipment are giving us hope that America isn’t done making great products. With the right people and infrastructure, anything is possible.